Stake Your Claim as the Greatest Pirate of All Time! Build a pirate empire in the uncharted Plunder Islands of the Carribbi-er, Cairebbe-er, near the Gulf of Mexico! Seize your destiny of buccaneerrific awesomeness, and gather hordes of pirates, hoards of doubloons, greater infamy, and ever more treasure! 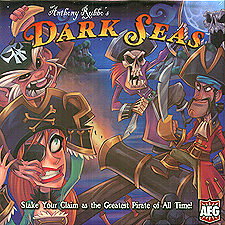 In Dark Seas, each player builds their island, filling its ports with docks, hideouts, and more. Each player rolls a set of custom dice, then everyone uses the result to sail their ships around their islands, and build their reputation by recruiting pirates, gathering doubloons, and acquiring treasure and infamy. Whoever builds the best reputation wins!